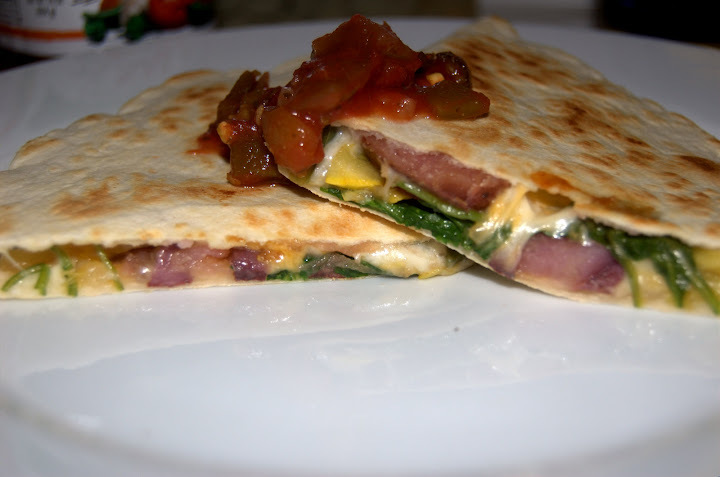 To use up some of the potatoes and squash, as well as some of our own deck-grown red bell peppers and some frozen ground sirloin, I figured we could make ourselves a quick and tasty lunch of quesadillas–beef and cheese ones for Josh (manly quesadillas) and vegetarian ones for me (I’m feeling a tad delicate today). 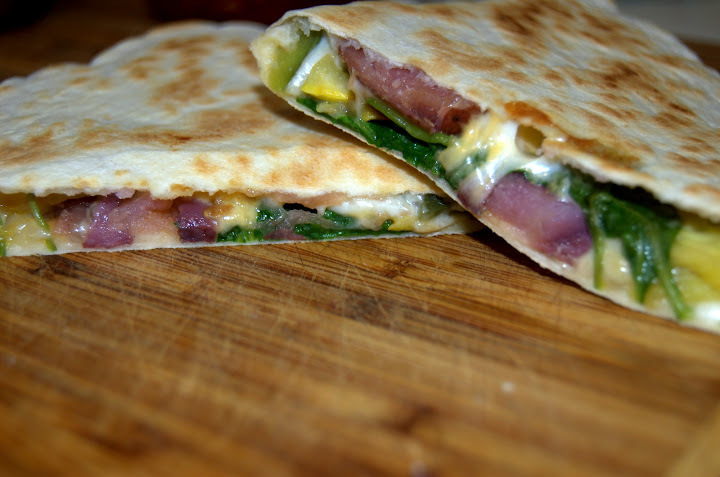 Inspired by a recipe I have stored away from Bon Appetit for potato, greens and goat cheese quesadillas, I figured…hey, why not? I call this a non-recipe recipe because..well, I don’t have any real exact measurements here, and you can substitute pretty much any of the ingredients that you like. It’s more of a method/idea suggestion kind of article today. I scrubbed clean 4 of our potatoes, which were new potatoes and about an inch and a half long each or so. 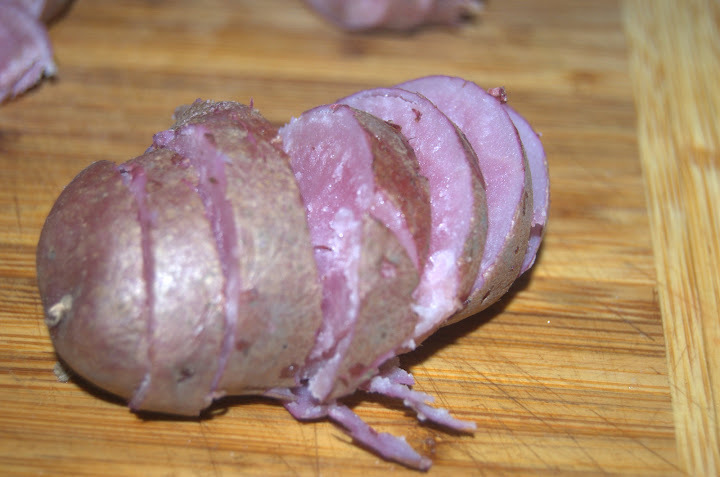 If you’re using a full-grown russet or something, one small potato will work. Then I pierced them with a fork and steamed them in the microwave for about 5 minutes. When they were done and cooled enough to touch, I sliced them as thinly as I could without breaking them apart. While the potatoes were steaming, I chopped and sautéed half a small onion, half a small cherry bomb pepper, a small red pepper and an awesome looking black pepper in a bit of oil. 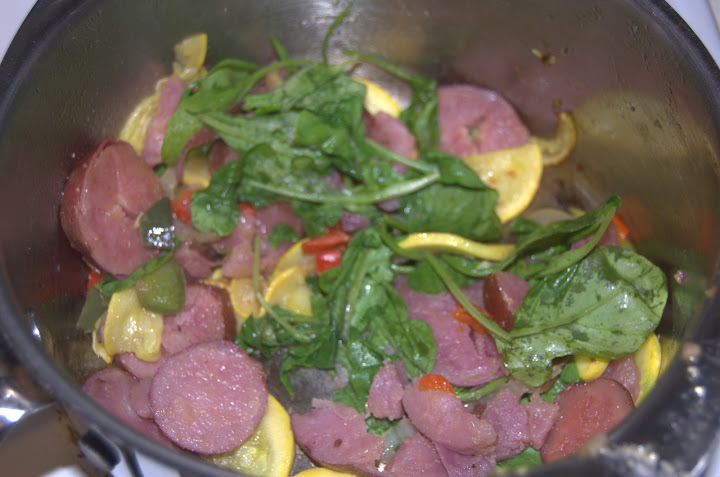 Then I added a quarter of the pepper mix to a medium sauce pan over medium heat and tossed in half a small yellow squash, sliced and the sliced potatoes, as well as a bit more olive oil, salt and pepper. I let it sit, stirring occasionally to keep the veggies from sticking. Then I threw in a handful of arugula to wilt. To the pan with the original batch of pepper mix, I added in a half pound of ground sirloin, a couple tablespoons of salsa, salt and pepper, and cooked until the beef was heated through. Then I heated up my flat top griddle to 350F. I’m lucky enough to have an electric griddle, but if you don’t, you can easily do these in batches in a big frying pan, bake them, broil them or grill them outside. I warmed up four burrito sized tortillas in the microwave, two at a time. 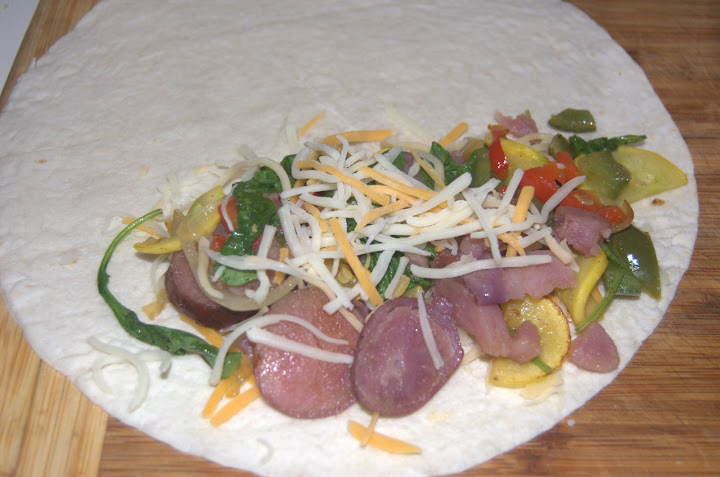 Then I began piling on the toppings, on one half of the tortilla: first a sprinkle of cheese (we use a Mexican blend), then half of the veggie mix, then another sprinkle of cheese. 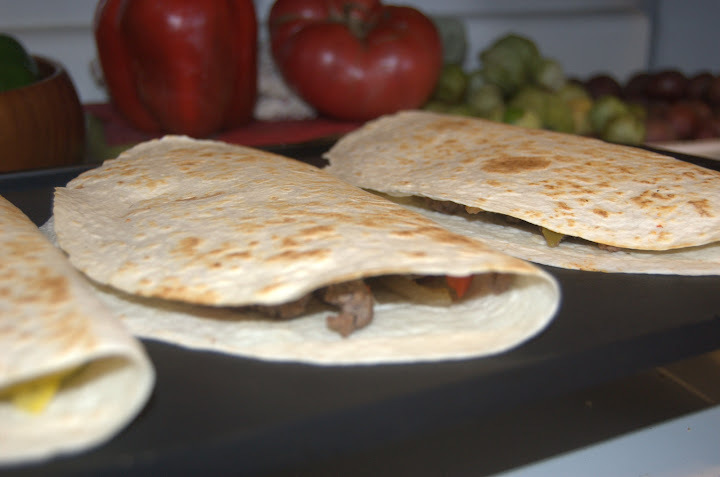 Then fold the tortilla over and set aside. Repeat this for the next veggie tortilla and then for the two beef tortillas. When all the quesadillas were ready, I put them out on the grill. Now this part takes very little time, you’re basically just melting the cheese and crisping up the tortillas. About 3 minutes on each side and they were done. Top with salsa and eat! 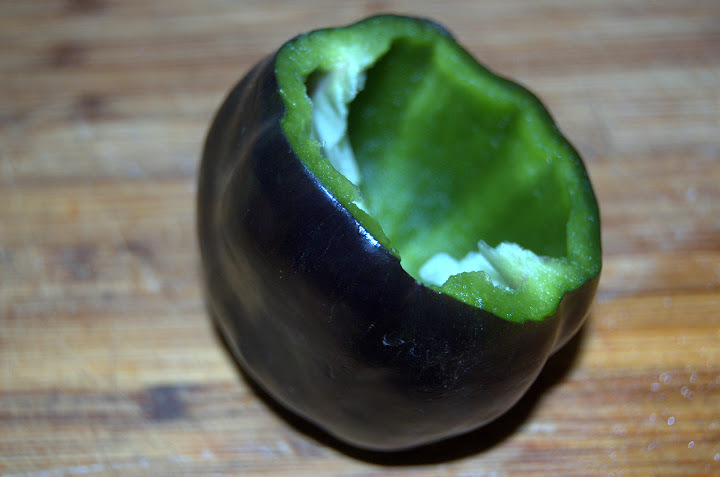 This entry was posted in General Musings and tagged local, Mexican, vegetables on September 12, 2009 by Lauren. Yum! I’d always prefer the vegetarian variants – I just love my veggies! That tomato will be one ofthe best you have eaten… we used to have those all the time in my mom’s garden and they are just delicious! if you ever get a strawberry tomato cherrish it! meaty jusicy delicious those are! A strawberry tomato, eh? I am intrigued. 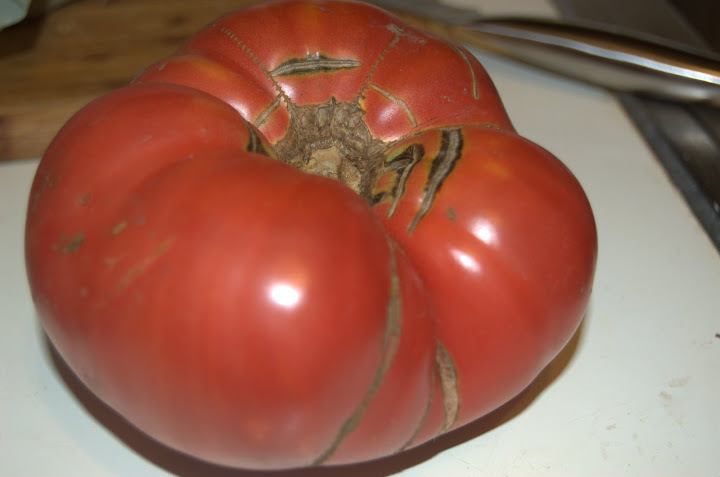 Incidentally, we also got another 18oz tomato this week–bright yellow. I love these colors!